The International School Breda is able to offer first-class international education at a reasonable cost to families thanks to funding from the Dutch Ministry of Education* and subsidies from the Province of Noord-Brabant. We require payment of a €500 deposit per child which is payable 1st of July prior to the start of the new school year. This deposit is a part-payment of the fees due in the following school year. The deposit is non-refundable should your child not return in a following school year without prior written notification. Company payments will only be accepted as full payments due 1st of August. * If you require to pay in a currency other than Euro’s please contact the school for alternative banking details on admissions@isbreda.com. At the time of application to the school, an admission fee of €400 is required. This fee is non-refundable and must be received before we can process your application for admission. During the school year, primary children and secondary students go on a variety of educational excursions within the Netherlands. The costs of such trips are included in the annual school fee, although there may be a small charge for lunch or refreshments. Secondary students may have the opportunity to travel abroad with the ISB. The cost of international trips is not covered by the school fee, but we do our best to keep the cost of such trips to a minimum. *The ISB is a member of the Dutch International Schools organisation, all of whom are partially funded by the Dutch government. 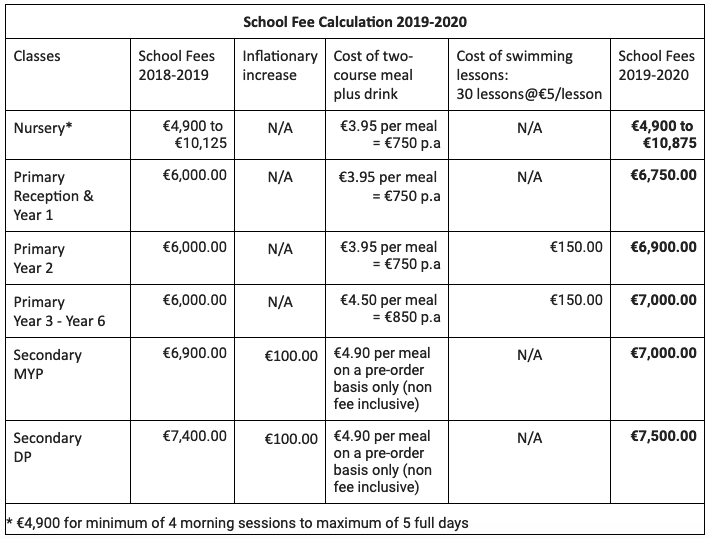 Since this funding doesn’t cover all costs, Dutch International Schools are allowed to charge school fees, within a pre-agreed range, with permission from the Dutch Ministry of Education.